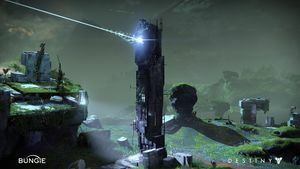 The Spire is a Vex construct that is used to open realms that are normally sealed outside of time and space, such as the Black Garden in The Garden's Spire Story mission or the Vault of Glass in the Raid of the same name. Spires first appear as a pillar of white energy forming from the ground up, much like Confluxes, then solidifying into a rock tower that opens the sealed realm being accessed. They can either be opened by a Gate Lord's eye or via Sync Plates. Because the Vex do not want intruders, they do everything in their power to make sure that Spires do not form, as shown by Praetorians being able to capture Vex Sync Plates and Gate Lords being able to keep Vex realms locked out of time. Spires only prominently appear in two activities in Destiny. Another view of the completed Spire.